Roughton Mill Hill tower mill was probably built in 1814 when Robert Bourne Joy took the business over from his mother and it has a datestone inscribed RB Joy 1814 set above the stage door. The site had earlier been occupied by two postmills that had stood together on the site - an earlier mill and a later mill. The six storey red brick tower with its stage around the second floor was originally painted white but reverted to plain red brick in later years. 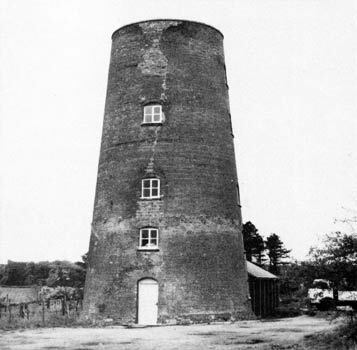 The mill tower was only 56 feet high and had a domed cap, an eight bladed fan and three pairs of stones powered by four double shuttered sails each with ten bays of three shutters. The WIDOW of the late Robert Joy, Miller, having carried on business since her Husband's decease, intends giving up the same on 22nd April next and begs leave to return her most grateful thanks to her Friends for past favours conferred upon her and solicits a continuance of the same on behalf of her son Robert B. Joy, who will succeed her in the above business. All persons to whom the said Widow stands indebted are requested to send their accounts in order that they may be discharged; likewise all persons who are indebted to her are requested to settle the same by the 22nd April next. Robert Joy snr died on 20th September 1794 aged 40 and his wife Mary Joy carried on running the business for the next twenty years with Robert snr's younger brother, Edmund Joy, managing the business for her. She remained living with her son Robert jnr at the Mill House. The lease expired in 1814 and Mary Joy then sold the business to her son Robert Bourne Joy. Faden's map of 1797 only shows one postmill and almost immediately upon taking over, Robert Joy demolished the remaining postmill and built a new towermill on the same site. It is probable that Edmund Joy remained working at the new mill as a brick near the west door bears the inscription E. Joy 1814. Robert Joy snr died in Roughton on 20th September 1794. aged 40. Edmund Joy was born c.1756 and died in Roughton on 14th July 1833 aged 77. Mary Joy died on 17th October 1847 at the age of 93 and her son Robert Bourne Joy died on 8th September December 1863 aged 71. When Robert Joy died his daughter Sarah continued to run the mill and the farm until she put the mill up for sale or let in 1867. 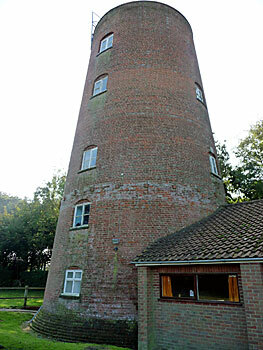 To be SOLD or LET, all that substantially Brick-built TOWER WIND MILL well situated at Roughton, within two Miles of Cromer, Norfolk, driving Three Pairs of Stones, with Patent Sails, seven Floors and capable of grinding on an average six Lasts per week, Granaries capable of stowing 60 Lasts of corn. Piece of excellent Pasture Ground, the whole with sites of buildings containing four Acres. All Freehold. The above Premises are well adapted for carrying on a very extensive and profitable business and immediate possession may be had. Apply to Messrs. Keith, Blake, Kent & Co., Solicitors, Norwich or to Henry Sandford, Estate Agent, Cromer. H. SANDERSON & SON have received instructions to Sell by Auction on Friday 9th October 1868 Three very powerful Draught Horses, Two Riding Horses, Miller's Carts, Harness etc., Outdoor effects and part of the HOUSEHOLD FURNITURE on the premises at Roughton Mill. H. SANDERFORD & SON will Sell by Auction on Friday 9th October 1868 the powerful Draught Horses, Riding Horses, Carts, Harness, Outdoor Effects and part of the Household Furniture on the premises at Roughton Mill. Frank Brown, who came to the mill c.1871 was born in Itteringham, where his father James Brown, was miller, farmer and maltster. WANTED at Michaelmas next, a respectable and steady man as MILLER. Good account keeper; to take the management of a mill. Apply O. G., Roughton Mills, Norwich. WANTED, a respectable Single Man as HEAD STONEMAN & GENERAL MILLER, with good references and must have knowledge of accounts. A. B., Post Office, Roughton, Norwich. Notice re John Leman late of Roughton, Miller, deceased. 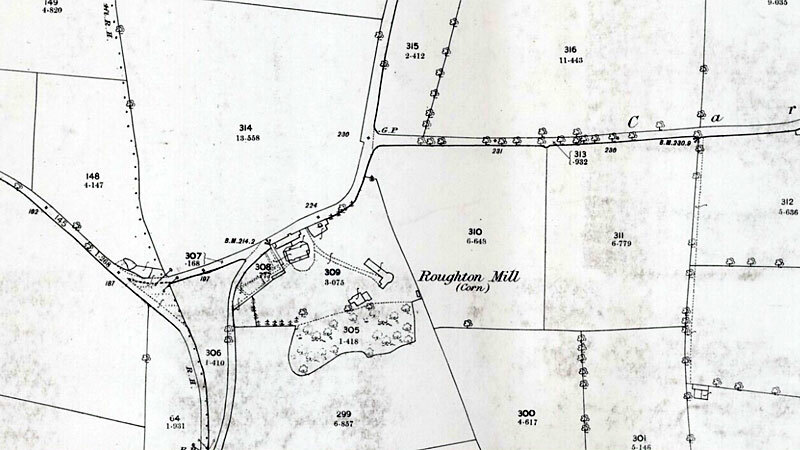 ROUGHTONM MILL with good Dwelling house, suitable Outbuildings and a Piece of Pasture land, the whole containing 3a. 0r. 0p., late in the occupation of Mr. Frank Brown. With the above can be hired a small FARM adjoining or near, with possession at Michaelmas. Apply Messrs. Blake, Keith & Blake, The Chantry, Norwich. 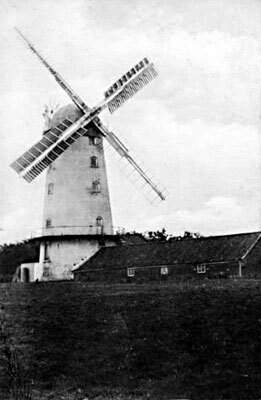 The Press family also owned the Yarmouth Southtown High Mill and when that mill was demolished in 1904, its sails were transported to Roughton and fitted to the towermill. Around 5.00am on Monday 17th September 1906 a strong northeasterly gale tailwinded the mill making the sails revolve fast in reverse. The massive amount of heat caused by the resulting friction set the mill on fire and despite the best attempts of the Cromer Fire Brigade, the mill was destroyed just leaving the tower shell. The granary survived but was later demolished. 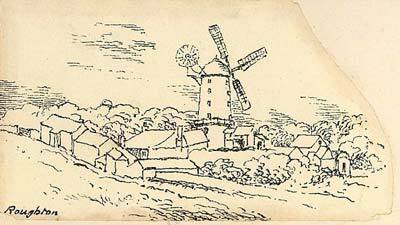 A gale which sprung up suddenly on Monday morning caused the destruction of Roughton Mill ... The wind started the sails, and the friction set up caused the structure to break into flame ... The mill, which was the property of the Bond-Cabbell Trustees, was in the occupation of Messrs. Press & Pallett. Wednesday September 19, 1906 "DUSTY"
Steamer used. 4 hours away. Supposed causes - friction from sails breaking loose in gale. Interior gutted and connecting buildings. 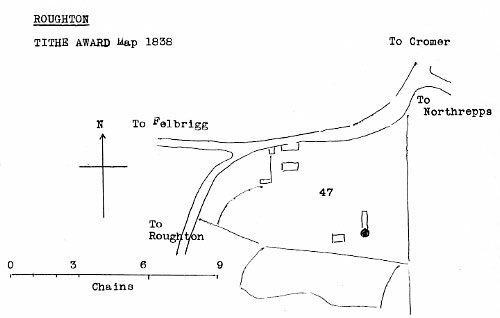 (Roughton not within area and brigade attended in error). Claim for expenses recorded £11 10s 6d. Lifeboat & Rocket Brigade out. A strong north-easterly gale was experienced at Cromer during Sunday night; and between five and eight a.m. yesterday the services of the Fire Brigade and the Rocket Brigade and the lifeboat were requisitioned. At the earlier hour the Fire Brigade under Captain J. K. Frost was summoned to Roughton Mill, some three miles distant, which was in flames. They could do nothing to save the mill, which was completely destroyed. The origin of the fire was due to the gale setting the sails at work, the friction thus generated soon causing the whole structure to burst into flame. The mill was the property of the Bond-Cabbell trustees and Mr. Press was the tenant. The mill stood very high and both from sea and land was very conspicuous for many miles. It was an old structure, dating as far back as 1814. The sight of the conflagration at that hour of the morning was described by an eye witness as truly magnificent. When the brigade reached the spot the fire had already got too great a hold and the was nothing more nor less than a pile of lurid flames. Fortunately it was found possible to save the granary, nor did the adjacent heath catch alight, as, at one time, was feared would be the case. The sparks from the burning structure went high up and spent themselves before their fall. Mr. Press, who lives in the Mill House, is we understand insured in the Norwich Union Office. A lady visitor in the house appears to have been to have been the first to have been awakened by the terrific noise caused by the sails revolving the reverse way at an ever increasing velocity until the friction thus caused resulted in one tower of flame. Roughton Mill was destroyed by fire on the 17th. ult., caused by a heavy gale releasing the gripes and starting the sails in the reverse direction, when the friction quickly set up a blaze. 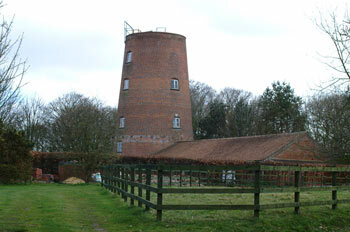 This mill stood three miles from Cromer and formed a well-known landmark, having dated from 18147. It was found impossible by the Cromer Fire Brigade to save the mill, but they prevented the extension of the flames to the granary. Soon after the fire, Frederick William Press and his family emigrated to New Westminster in British Columbia, Canada. 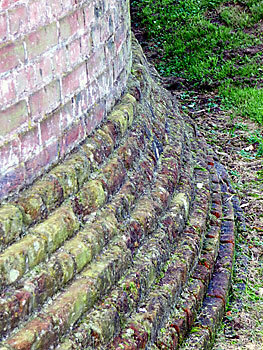 When the refronted guttering was removed the date 1778 was found on the cistern. On the road side side of the outbuilding, the inscription R. Joy 1774 was found, this being the date Robert Joy took over the postmill. 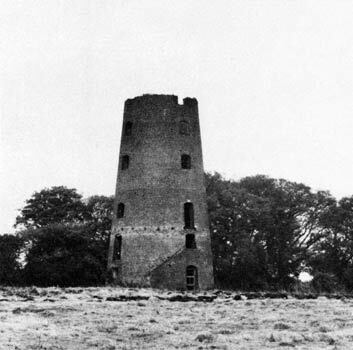 Work commenced on renovating the tower during 1978 for use as the headquarters of the local scout group and a new building was erected adjoining the mill following the same lines as the old granary. Mr. A. J. Thrower, Great Yarmouth Millwright who worked on the High Mill (Southtown, Yarmouth) etc. told me in 1951, "The Sails from the High Mill were fitted to Roughton Mill, so she must have been very powerful." 1st Rural Scout Group is hoping to repair mill for use as their Headquarters. Group Scout Leader:- Richard Baker, ... Roughton. 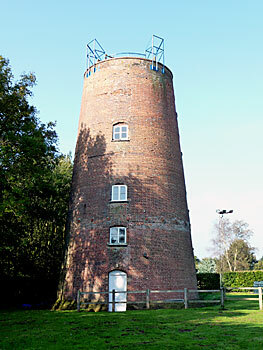 A SCOUT group's future looks to be secure after a successful appeal to buy their headquarters in an old windmill. The plea for funds by the First Rural Scouts, launched last July, has raised almost £227,000 to buy Roughton Mill, near Cromer. A 30-year lease, which gave the Scouts use of the building for a peppercorn rent, was coming to an end, leaving the group facing increased rent or the option to buy the mill for an agreed price of £200,000. A rise in rent would have put too much strain on the group's resources and an outright purchase of the 194-year-old building was their only option, said Scout group chairman Dave Stow. Although the Scouts were still looking for a further £16,255 to reach their appeal target - which would cover the cost of fire regulations, plasterwork and other fees. The money raised so far was enough to buy the mill from the present landlords and would be held in trust by the Scout Association. Most of the money had been raised through charitable trusts, anonymous donations, youth projects pots and donations from the county Scout group. The success of the appeal will mean that more than 100 Beavers, Cubs, Scouts, Brownies and Guides can continue to use the mill each week doing activities such as camping, abseiling - off the highest abseiling tower in Norfolk and many other adventures. Mr. Stow said that when the sale went through the Scout group would be able to carry on, which was in doubt if they had not raised the money. Major Anthony Gurney of Manor Farm Northrepps, was instrumental in the raising of the £200,000 necessary to buy the mill. Datestone on new building erected on the site of the old granary. 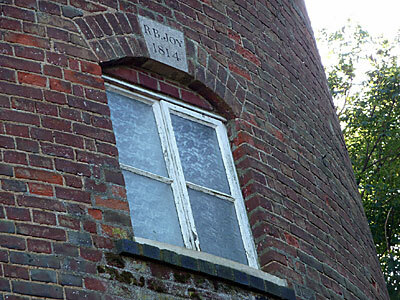 The stone above the window "RB JOY 1814" is not the original. 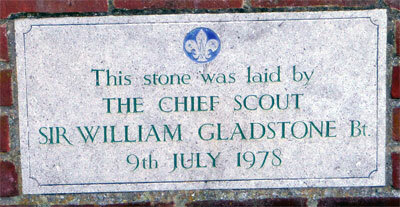 When the mill was renovated in the 1970s for the Scouts, the original stone was broken - whether by the fire or just age. 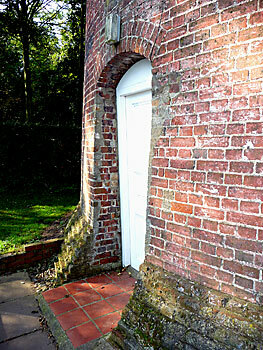 An identical replica was made and replaced into the arch when the windows were replaced (1977). The original stone is now set in the wall on the ground floor, inside the tower. In the 1906 fire, the Fire Brigade was delayed because the horses which pulled the fire engine were also required to launch the Cromer lifeboat which had been called out for a sea disaster. I recall that the Fire Brigade was in the charge of a Mr Frost. I found this in the archives of Eastern Counties Newspapers when I did some research in the 1970s. 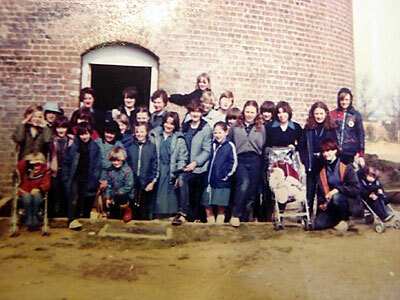 I was Group Scout Leader at the time of the rebuild in the 1970s. Robert Copeman of Itteringham, had a daughter who married into the Spurrell family. Since then I've been working on a book about Bessingham, where the Spurrells owned an estate from 1766 till 1970. One of the Spurrells, John, married his first cousin Elizabeth Joy of Roughton in 1814. Her father Robert Joy and brother Robert Bourne Joy ran the mill there for many years. Robert Bourne Joy, a bachelor, died in 1863 and his sister Sarah, a spinster, died in 1867: these were the last surviving members of the Joy family and their next of kin was their nephew Daniel Spurrell of Bessingham. On a recent trip to the Norfolk Record Office I discovered the collection MC 97/15, 538x3 (letters of Benjamin Bond Cabbell of Cromer Hall). There is a fair amount of correspondence back and forth between B. B. Cabbell and the Norwich solicitors Keith & Blake, who were acting on Daniel Spurrell's behalf, and some letters from Daniel too. It appears that Daniel sold Roughton Mill to B. B. Cabbell as well as property in Overstrand and Cromer that he had inherited from his aunt Sarah Joy for £3,750, the transaction being completed at the end of 1868. The Roughton page of your website includes an 1867 advert for the sale of the mill, but it appears from the letters that B. B. Cabbell made a private offer to Daniel Spurrell which included purchase of the Overstrand and Cromer properties. The letters also mention the draft of a 1-year lease by Frank Brown beginning at Christmas 1868, although this document is not included in the bundle. My understanding is that Daniel Spurrell used the money he inherited from his Joy aunt and uncle, as well as from the sale of their properties, to build his new Manor House at Bessingham in 1870, having also bought the right to be lord of the manor in 1867, so the Joys are an important part of my story. The Spurrells were related by marriage to the Joys, who owned Roughton Mill in the 18th and 19th centuries. When the last Joy died in the 1860s the mill passed to Daniel Spurrell, who later sold it to Benjamin Bond Cabbell of Cromer Hall. Mary Wright (25) female servant.